Mary Mallon, an immigrant woman working in New York City in the early 1900s, became the most famous symbol of infectious disease in the United States. But the true story behind "Typhoid Mary" is more terrifying — and depressing — than you ever realized. 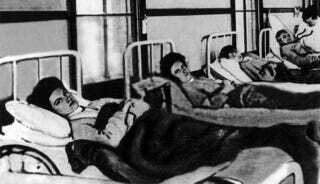 Typhoid was one of the twentieth century's most terrifying killers, in part because an infection could spread through a house well before anyone knew what they were dealing with. The first week of an infection seems almost innocuous. The victim has a fever and some abdominal cramping, but unless she develops a bloody nose, which happens in only one quarter of the cases, there's nothing to distinguish typhoid from most other ailments. During the second week, the fever shoots up, and the patient becomes delirious. Blood clots form under the skin and the entire abdomen becomes distended. The third week brings inflammation of the brain and intestinal hemorrhaging. The death rate of those infected is estimated at anywhere between one in ten and three in ten. In the 1900s, doctors finally believed they could get a handle on outbreaks of typhoid. They had determined that bacteria were the cause of the disease, and could tell if the bacteria - usually transmitted through contact with feces - was present in a patient. What's more, the science of epidemiology was coming into its own. Doctors could trace outbreaks, determining how they spread from one place to another. So, in 1906, when Charles Henry Warren's family vacation on Long Island was interrupted by six of the eleven people in the rented house coming down with typhoid, he decided to find out why. Warren hired George Soper, a civil engineer, who took one look at the breakdown of the house, and decided the most likely culprit was the cook. Impossible, thought the Warrens. The cook, a thirty-something immigrant from Ireland, remained the picture of health throughout the outbreak. But Soper was able to trace her employment history back, and found that she had changed jobs frequently - once a year for seven years. At every one of her seven jobs, people had become sick with typhoid. One person had died. The cook Mary Mallon was not pleased to be accused of giving her employers typhoid. When Soper first asked her for urine, feces, and blood samples, she threatened him with a pronged meat fork until he left. He took his suspicions to the New York Health Department, and went to Mallon's house with officials and police officers. After a fight, a flight, a search, and another fight, she was forced into custody, and was to remain in custody for three years. At that point, some members of the public were on Mallon's side. Although everyone feared typhoid, and the health department did have the right to quarantine people who were sick with it, no one could argue that Mallon was sick. All the time she remained in custody, she didn't even have a cough. Although both health officials and the public eventually realized that seemingly healthy people could be carriers of the disease, it was hardly Mallon's fault that she'd infected the families where she worked. It's only recently that a team of scientists at Stanford figured out the mechanics of how Mallon could be infected but asymptomatic. Macrophages, the immune cells that "eat" foreign bodies, are made aggressive by the inflammatory response early in an infection. After a few days of fighting the infection, the chemical stew that the macrophages inhabit recedes, and they become less aggressive. At that point typhoid bacteria can actually penetrate and live in the very cells that are meant to devour them. The ailment is silent and tough to treat, even now. Mallon was also tough to treat, although the health service didn't really attempt to make her comfortable. Mary was isolated on North Brother Island, a quarantine facility off the coast of New York. She was kept there for years, during which she was sometimes neglected, sometimes showed off to visiting interns of officials. She was forced to give 163 samples of various bodily substances to the doctors there, 120 of which tested positive for the bacteria. Because the bacteria were often found in her gallbladder, various doctors pressured her to have her gallbladder removed. In the end, Mallon sued for her freedom, and lost. However, in 1910, after three years of confinement, a new health commissioner declared that she could be set free, if she agreed to change her profession. She was given a job in a laundry. She disappeared. Although people called Mallon "Typhoid Mary" during her first stay on the island, she became infamous five years after she was released. In 1915, Sloane Maternity Hospital experienced an outbreak of typhoid. The disease was, for the most part, confined to the staff, which helped health officials track it. It still took them time to pin down the source of the sickness. After twenty-three people got sick and two people died, investigators found a Mary Brown working in the kitchen. Mary again ran when she saw the health officials, but was apprehended a short time later. She was sent back to North Brother Island, and did not leave it until she died of complications from a stroke twenty-three years later. Although Mallon maintained she was not a carrier of typhoid until the day she died, her behavior suggests that she guessed something was wrong. She changed her name many times. She had a habit of quietly leaving a household after typhoid broke out, and making no mention of it at her next place of employment. She didn't even hold with basic hygiene requirements like hand-washing. At the same time, the joint condemnation of public health officials and the press would make anyone want to change their name. And who would want to stay in a household taken by typhoid? Exactly what Mallon knew about her condition, and what she believed, will always remain a mystery.